Does the word “PICTURES” sell more copies of the paper? Whatever the circumstances (I haven’t read the story yet), this sounds like a terrible tragedy. 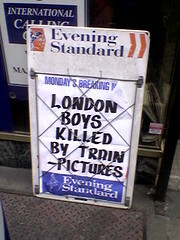 I often see Evening Standard hoardings with the word “PICTURES” after a dash after the headline. In this case I felt its use was particularly insensitive.